I am thrilled to announce that our 1st Tell It: at Bar Four was a huge success. We had a fantastic turnout, tons of names in the can & some of the funniest stories we’ve heard in a while. Cammi Climaco shared a feel good(fellas) story about how her dad proves his love, and newcomer to the storytelling scene, Elizabeth Wine told us how strangers on a Brooklyn corner bullied her into rescuing a pit bull … but only after making sure her apartment was suitable. 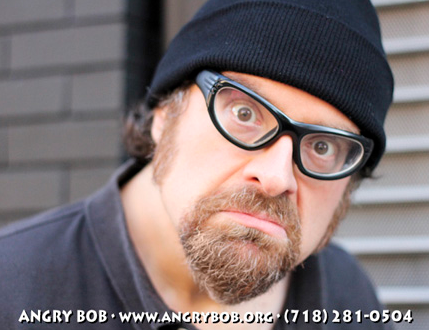 We also had a special appearance from Angry Bob, known for his recurring role on HBO’s Bored to Death and his gig at the Seventh Avenue Armory where Victoria & I put on a show for the folks who had been displaced by Hurricane Sandy. After the storm, over 300 people from Far Rockaway were relocated to cots lining the massive track of the now YMCA facility, so we thought it would be cool to get some storytellers together for a performance. Well, I sent out the word on Twitter and we ended up with 5 solid performers … which gave us a 1:1 ratio with the audience. Turns out the shelter residents were from long-term care nursing homes and we’d been given a space near the far corner of the massive structure. Our audience consisted of two sleeping octogenarians, a crumpled, non-responsive man who had been put there by a volunteer who needed to run out to her car for something, and a couple of folks Victoria wrangled over, who ended up being our only coherent audience members. Their names were Miss Ina and Herb and they first met at the shelter. Herb was a large, Brooklyn-Italian man with a thick accent and a raspy smoker’s laugh. Miss Ina was a short African American woman with a sweet smile whose family was from the South, but who had spent the majority of her life in New York. They smoked the same Newport menthols, shared the same outgoing personality and had lived in the same neighborhood before the home. They enthusiastically took seats in the front row and shared stories with us about Brooklyn while the klezmer band that performed before us packed up their gear. Okay, y’all. Looks like the stage is ours. Let’s start by bringing up our first storyteller, a comic who drove all the way here from Connecticut. Me: So, one day Grandma sent me out to shell peas on the back porch. Miss Ina: Did you say peas or beans? Me: Peas. They were black eyed peas. Miss Ina: I don’t mind shelling peas. But butter beans are something awful. Me: Yes ma’am, they are. I always hated shelling butter beans … but I had to shell them, just like those peas Grandma gave me that day. It was actually pretty cute and we just ended up having group conversations led by a performer rather than actual performances. Before we got started, I felt bad that we’d called three other people out to Park Slope to do a “show,” but once we finished I think we all felt we’d made a difference … if only to help part of Miss Ina & Herb’s day go by a little faster. That being said, I’ll definitely do a little more research before our next shelter show.